In August 2010, I was appointed Associate Director and Africa Director for the Center for Tropical Research and since July 2013, I hold joint faculty positions as Adjunct Assistant Professor at both the Institute of the Environment and Sustainability and the Department of Environmental Health Sciences, in the School of Public Health. My current research interests are examining the link between biodiversity and human health and supervise a team on the National Institutes of Health (NIH) research project to study the spill-over dynamics of avian influenza in both Cameroon and Egypt. I also serve as a visiting Lecturer to the National University of Rwanda and to the International Bilingual Academy (IBAYSup) in Yaounde Cameroon where my major focus is on critical overview of the theory and practice of Environmental Impact Assessment (EIA) relative to biodiversity conservation, ecotourism and sustainable development. Multi-country collaborative project planning and management; capacity-building in African conservation, particularly ornithology, ecology and evolution of tropical diseases; small NGO development; regional advocacy and networking for conservation in Africa; dealing with international multilateral agencies; collection and analysis of ecological data for teaching and research in Environmental Impact Assessment (EIA) as well as Tropical Ecosystems and Landscape Change. 5. Kevin Y. Njabo, Anthony J. Cornel, R.N.M. Sehgal, C. Loiseau, W. Buermann, R. Harrigan, J. Pollinger, G. Valkiunas, and T.B. Smith. 2009. Coquillettidia (Culicidae, Diptera) mosquitoes are natural vectors of avian malaria in Africa. Malaria Journal 8:193, doi: 10.1186/1475-2875-8-193. 6. Kevin Y. Njabo and Michael D. Sorenson. 2009. Origin of the endangered Bannermanâ€™s turaco (Tauraco bannermanni) in relation to historical climate change and the distribution of montane forests. Ostrich, Journal of African Ornithology 80 (1). 7. Kevin Y. Njabo, Rauri C.K. Bowie, M.D. Sorenson. 2008. Phylogeny, biogeography and taxonomy of the African wattle-eyes (Aves: Passeriformes: Platysteiridae). Molecular Phylogenetics and Evolution 48(1), 136-149. 9. M. Languy, K.S. Bobo, F.M. Njie, K.Y. Njabo, J.M. Lapios, R. Demey. 2005. New bird records from Cameroon. Malimbus 27, 1-12. 10. Kevin Y. Njabo. 2001. 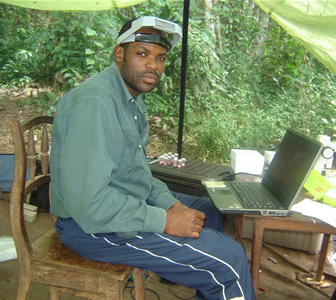 The Cameroon Ornithological Club and the Important Bird Area Process in Cameroon. Proceedings of the International Seminar for the Study of Bird Migration in Latrun Israel. April 29-May 11, 2001. 11. Bobo, K.S., Njabo, K.Y., Anye, D.N., Languy M. 2001. The status and distribution of the Bamenda Apalis, Apalis bamendae in Cameroon. Ostrich 15:110-113. 12. Demey, R., Njabo, K.Y. 2001. A new sight record in Cameroon of the distinctive race crossensis of Green-throated Sunbird Nectarinia rubescens. Malimbus 23 (1) 66-67. Bobo K.S., Anye D.N., K.Y. Njabo and L. Nayuoh. 2000. First records of Tufted Duck Aythya fuligula in Cameroon. Malimbus 22:91-92. 13. Kevin Y. Njabo. 2001. Training in waterbird counts and wetlands management in Cameroon. Report to Wetlands International, Dakar, Senegal. February 2001. 14. Bobo, K.S., Njabo, K.Y., Anye, D.N., Languy M. 2000. First record of Tufted Duck Athya fuligula in Cameroon. Malimbus 22(2) September 2000. 15. Kevin Y. Njabo. 2000. The Netherlands, Waterbirds and Important Bird Areas. Report submitted to the Royal Museum of Central Africa in Tervuren, Belgium. 11-15 August 2000.